Puppies are all doing well and I plan to do some pictures later today. Their eyes are opened, their dew claws have been removed, and they’re just doing what new puppies do…eat, sleep, and poop! 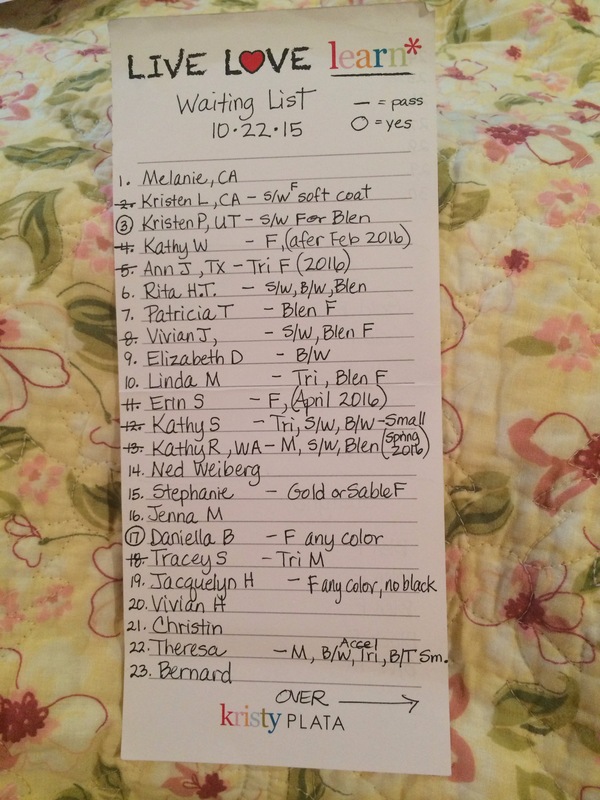 I’ve heard back from many of you on the waiting list and I want to thank you for responding! This post is to show you the updated list and ask again for you to let me know if you have any interest in the current puppies, or if you want to pass on these 2 current litters. If you look at my photo below, you will see either a line through the number, or a circle. The line means that family has let me know they want to pass on these puppies. The circle means that family has said YES!, they would love a puppy from these current 2 litters that will be ready just before Christmas. I am asking now to hear from the rest of you! If your name does not have a line or a circle, please email me and let me know your plans! Several of you are waiting for puppies that we have available (blenheim females), so if you’re ready, we can match you to your first choice puppy, but I need to know! We receive emails daily from people asking if we have available puppies. My answer can’t be solid until I hear from all of you. People are looking now for Christmas puppies, and we have them! But everyone on the list has first priority, so I have to hear from you all first! Please respond ASAP!! Puppies are growing and every day brings us a day closer to when they can go home! Could you please email me directly at silverpawcavachons@gmail.com? Thanks.